Just as we have waved selection boxes goodbye for breakfast and have embarked on our “new year, new me” challenges, it’s no wonder that the new year novelty is starting to wear off. So much so, that surveys show that Monday, 15 January is the bluest day of the year, “Blue Monday”. Well, it doesn’t have to be…as Citroën is looking to make you feel good by carrying out random acts of kindness to make a real difference and changing the day to Feel Good Monday. Citroën is inviting people to nominate someone special on Feel Good Monday to receive a well-deserved treat. Maybe your husband’s Christmas gift got lost in the post, or your child’s iPad smashed? Well, why not get involved and nominate your friend or family member for a prize on the Citroën Ireland facebook page. Each time you nominate a friend to receive a treat on Feel Good Monday with the #CitroenFeelGood, Citroën will make a €2 donation to children’s charity Make-A-Wish Ireland on your behalf, with a target to reach a total donation of €3,000. 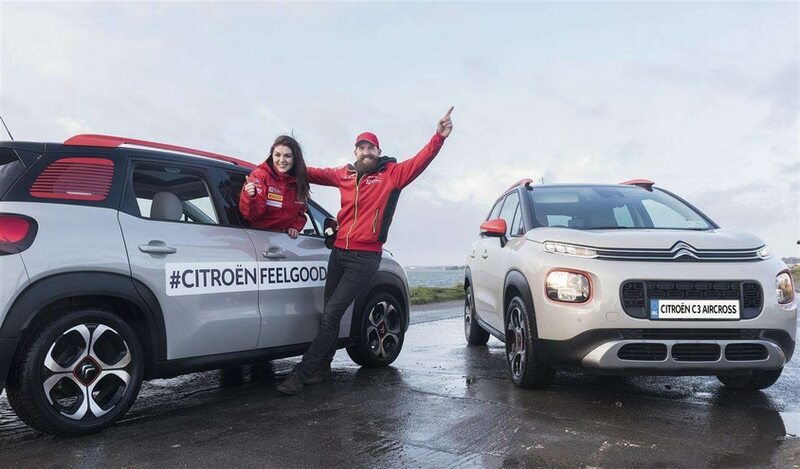 The Citroën team, led by Make-a-Wish Ambassador Sile Seoige and comedian Damian Clarke, will also be hitting the streets of Dublin on the 15th January in the convoy of New C3 Aircross Compact SUVs on a mission to spread the Feel Good vibes by carrying out random acts of kindness as they go. Pictured launching “Feel Good Monday” is Broadcaster and Make-a-Wish Ambassador, Sile Seoige and Comedian, Damian Clarke with the all New Citroën C3 Aircross Compact SUV.